Prost! Celebrate Oktoberfest in style with our LIMITED EDITION 34 oz. 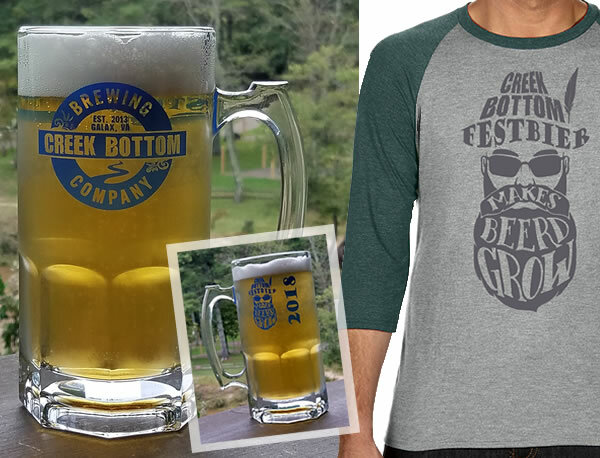 glass CBB German Beer Stein and CBB Festbier Raglan T-Shirt. Both were created in honor of Creek Bottom Brewing’s first ever Festbier releasing soon!!!! We only have a few cases of these steins & a limited number of tees, so get one before they head on out the door. In-store pick up only (during Oktoberfest on Sept. 22 at Big Bottom or after that date).